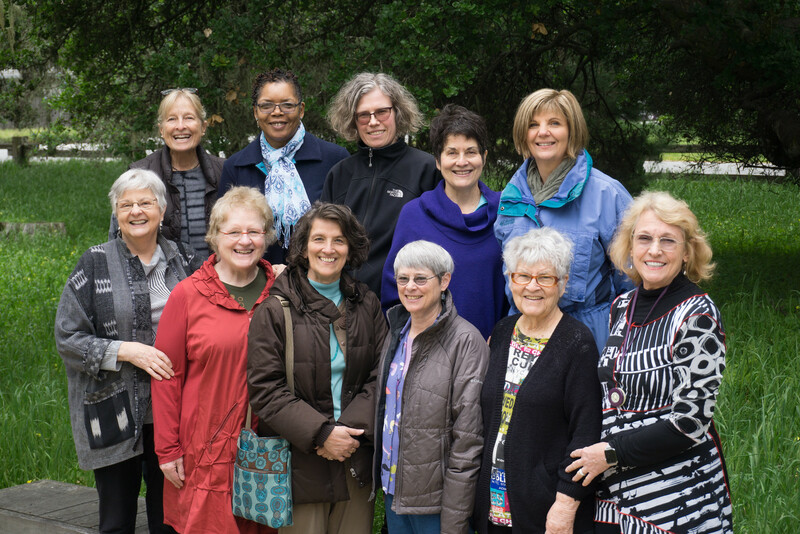 A group of ladies thrilled to be sewing with Jane. 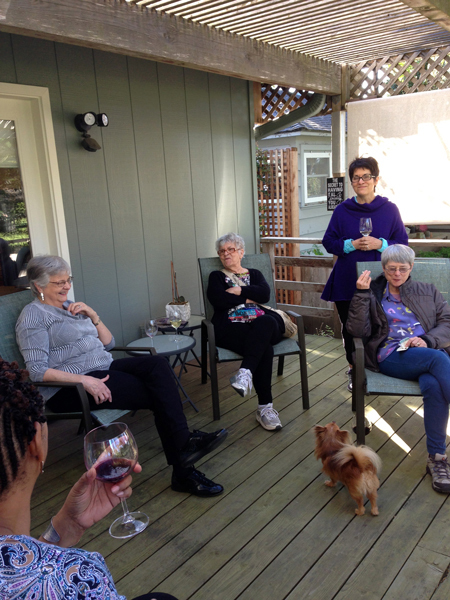 We all had a fabulous time at Jane's sewing workshop. 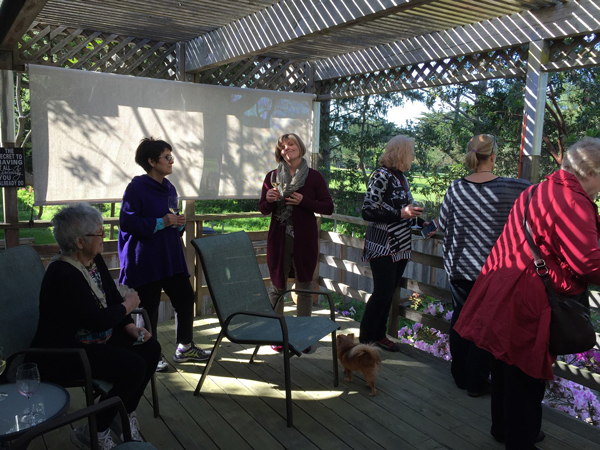 The laughter and fun was infectious. The sewing was inspiring. 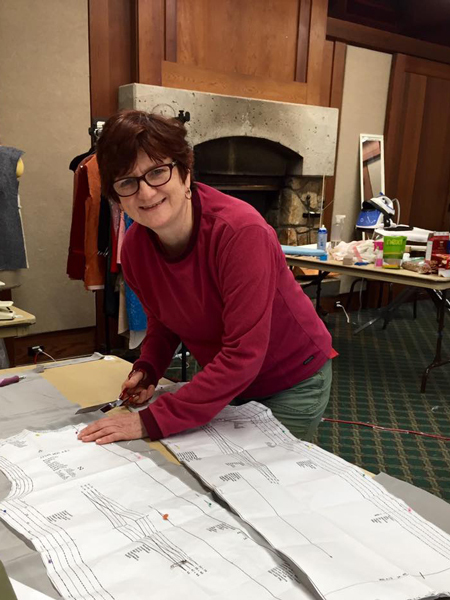 Watching the women plan and design their garments was fascinating, and then seeing the end result was just the icing on the cake. We were all sad to see the time together end. 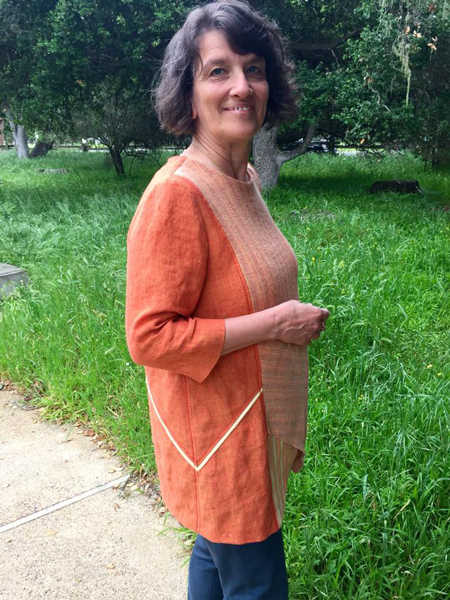 Barbara had designed and machine embroidered the hem section of her pants before the retreat so had time to sew them up. 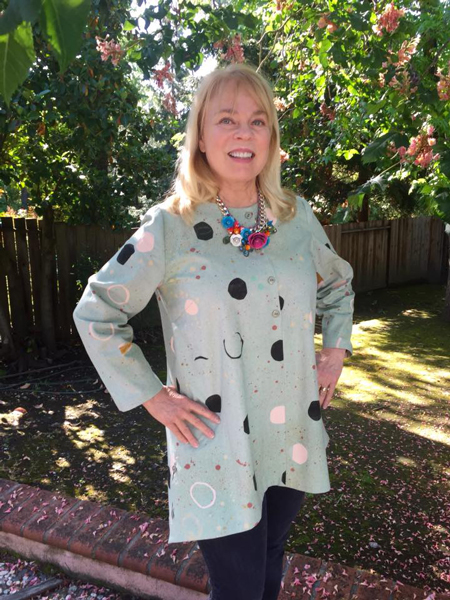 They look so cute on her ...it's a Marcy Tilton Pattern. Barbara's daughter Katie just graduated from St.Mary's College so Like a good"Mom" she embroidered this amazing wall hanging for her English Major daughter. What a gift...the software is available for purchase. 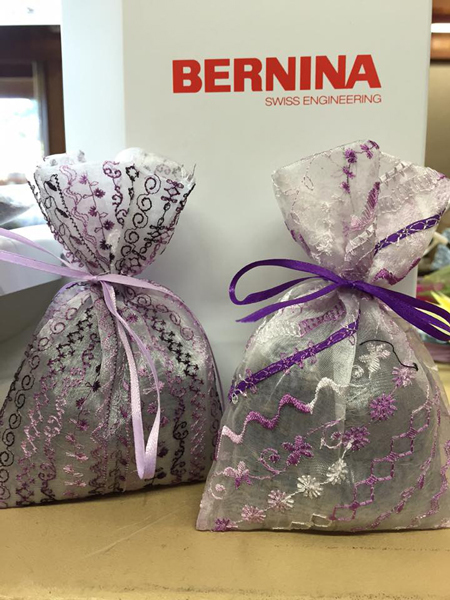 Her lavendar filled sachets gave a lovely smell to the sewing room. 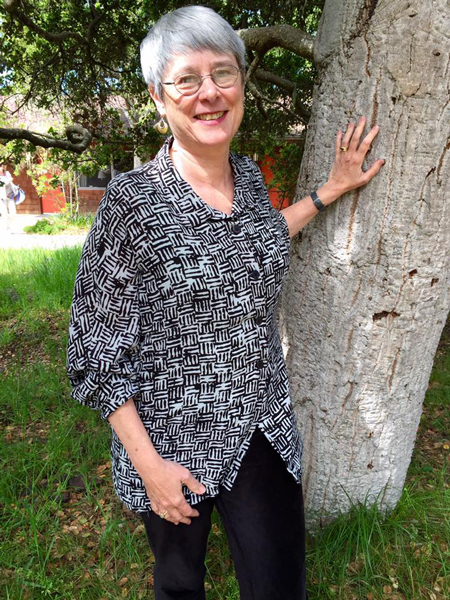 Anne made a stylish blouse with batwing sleeves in a very,very fine rayon. 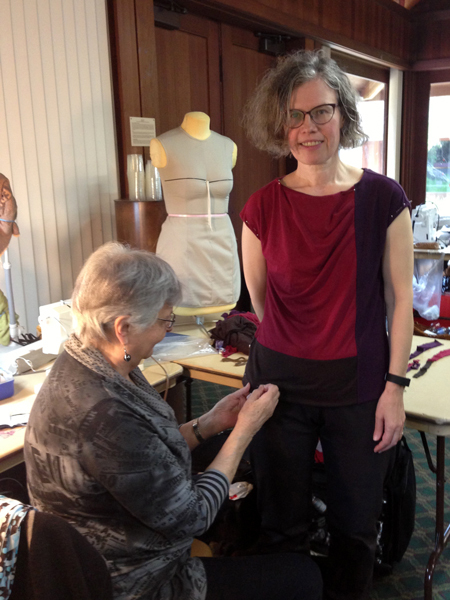 She also cut out a StyleARC blouse called the Issy in an exquisite silk knit from Emma One Sock. 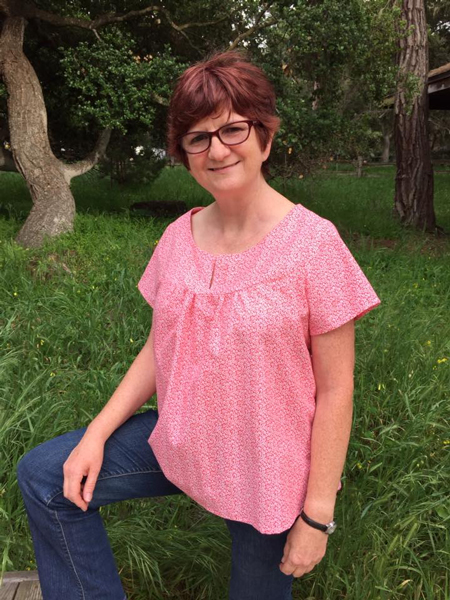 Ann's StyleArc Issy silk knit top. 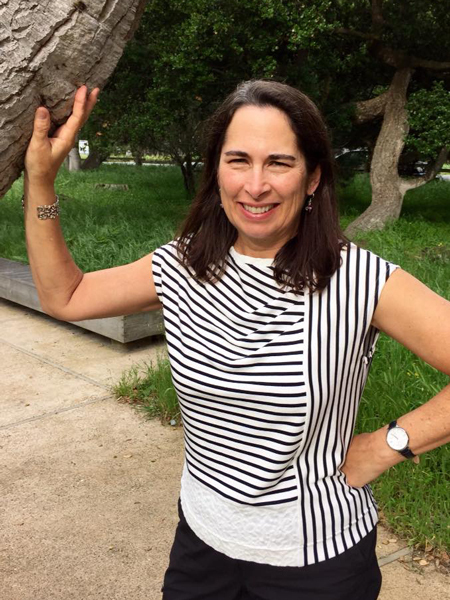 Ellen made a lovely StyleARC shirt at Asilomar. 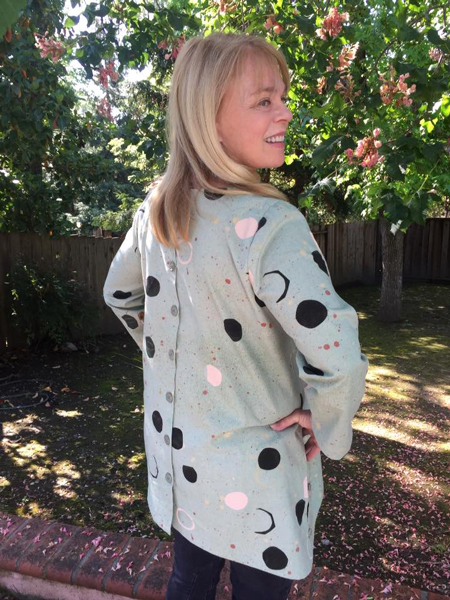 The fabric is a fun Japanese cotton from Marcy Tilton. 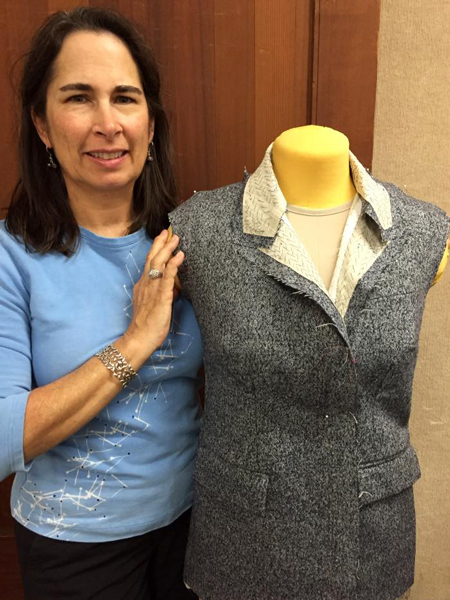 Santina worked on a StyleARC vest which was challenging. To finish the garment, she needed to buy some faux Persian lamb from Emma One Sock. 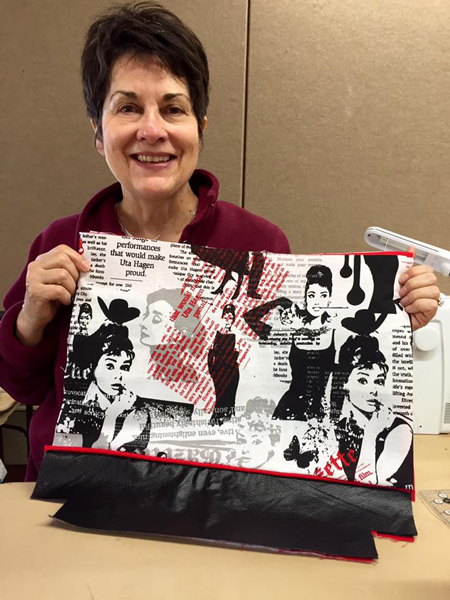 So she started to make a really cool tote bag with fabric she bought in New York. 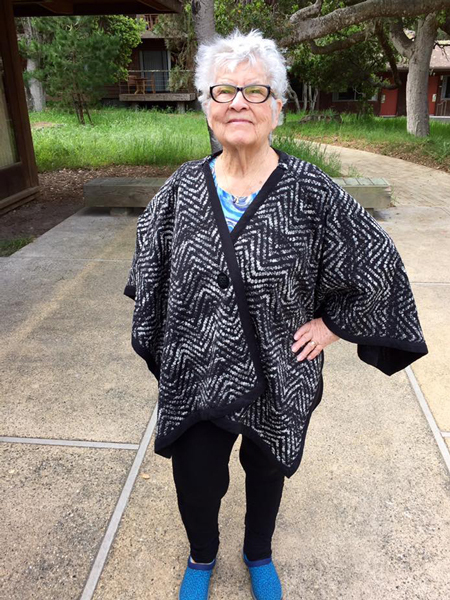 Sylvia finished her cape at the sewing retreat. Instead of binding edges, Jane suggested that she turn the wrong side over to the right side. It is very effective and frames the edge. Vicki comes to the Wednesday evening sew labs, and she made a top, a dress, and started a pair of denim shorts. 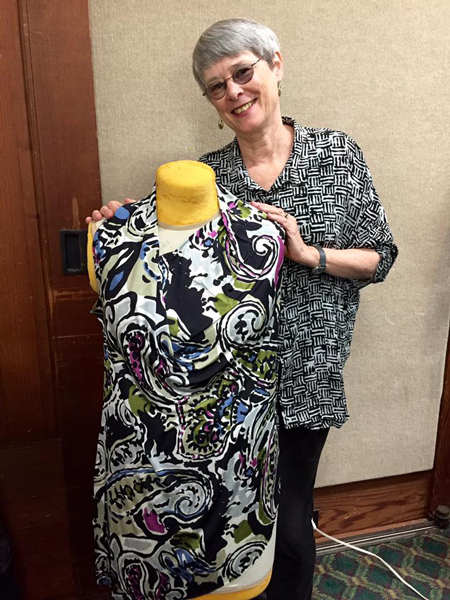 Maria is making a beautiful French couture jacket with fabric she bought at Mendel Goldberg in New York. It is a lengthy process as the fabric is cut out on a single layer then each piece serged to stop it fraying. Then each piece is backed with silk organza and lined with silk charmeuse. She also made two skirts! The striped denim came from JoAnn's with zippers from Botani.com. in New York. 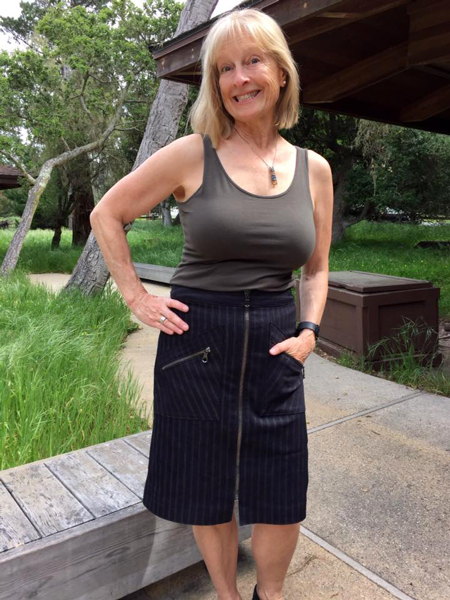 The skirt pattern is StyleARC from Australia. 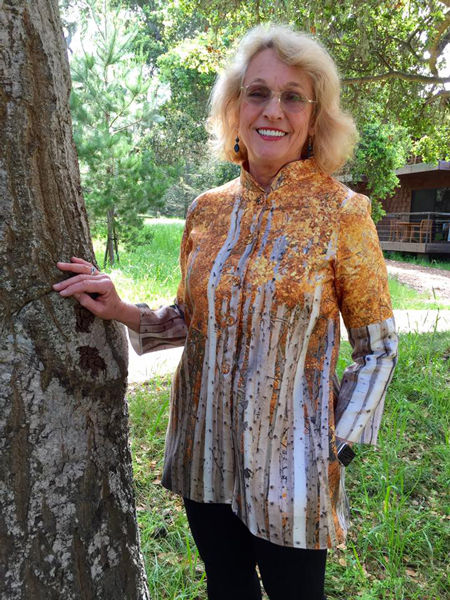 Sally came to the Asilomar retreat for 4 nights and worked on tailoring her Claire Sheaffer jacket. She created beautiful welt pockets. 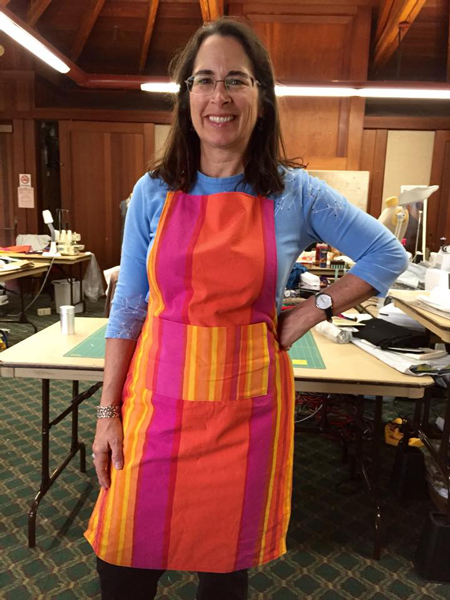 For lighter relief, she made aprons for herself and her sister out of fabric that was a big pillow on her bed when she was a teenager! She also made a cute StyleARC top. 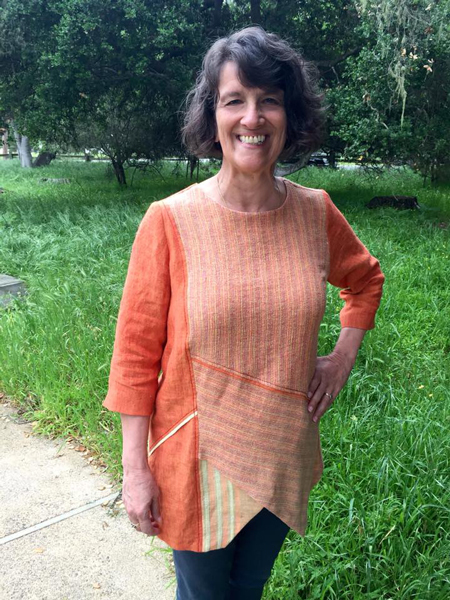 Vicki came for 7 days to the Asilomar sewing retreat and worked on the Lani Woven Tunic by StyleARC. 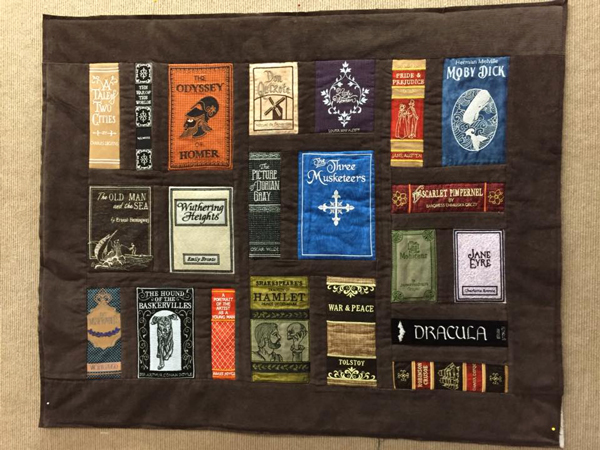 She had fun designing where to put the different fabrics, where to topstitch, and where to flat pipe the seams. It is a great success! 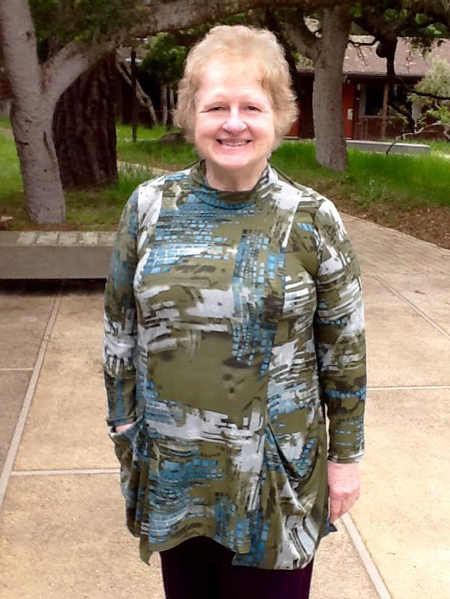 Diana made a beautiful silk jacket in her Spring colors. She will add a silk lining when she gets home. One of the other students happened to have a selection of buttons with her, and had the perfect orange and grey buttons for this jacket. What a happy coincidence. 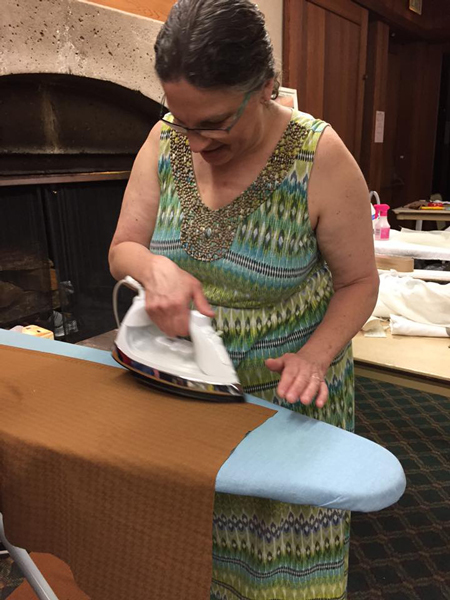 Jasna worked on tops for the seven days of the retreat. She went home with a most of them finished. The top above is the StyleArc Lotti pattern. 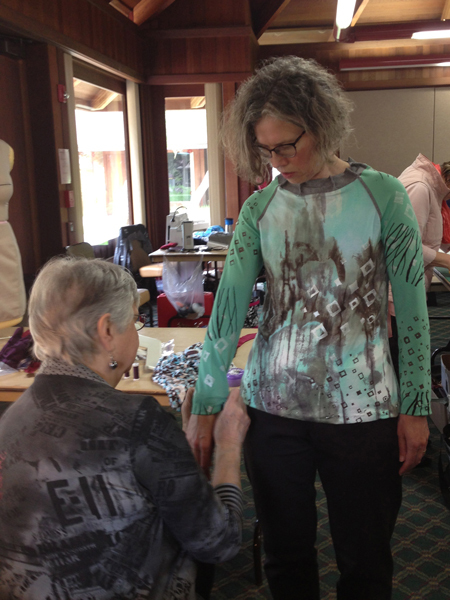 Jasna screened this top at the Auburn Sewing Retreat, and is now doing the finishing. The design is fabulous. Putting the band around the neck and down the front took a bit of careful sewing, but it was done perfectly. 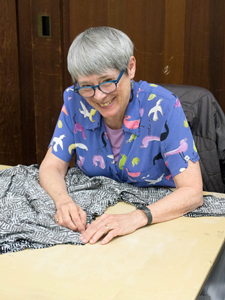 Sandy is from New Jersey, and worked on fitting muslins. 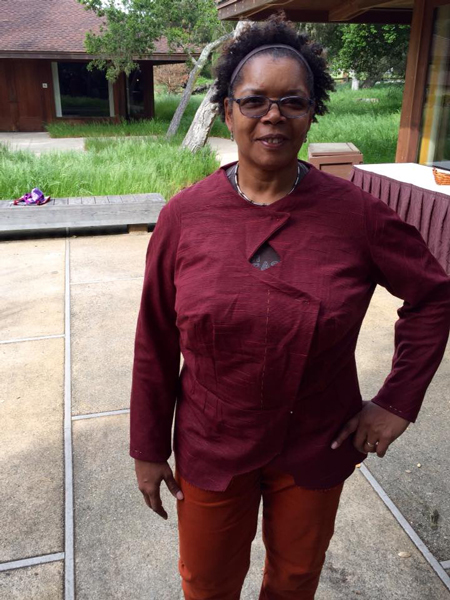 One of the muslins is a Claire Shaeffer jacket V8621 in burgundy and the other is a StyleArc tunic in a batik. She also made a two bags using Jane's four pocket purse pattern. 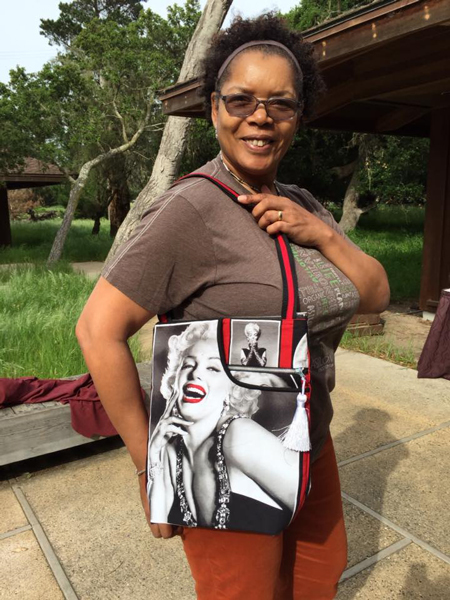 She she enlarged the pattern and used a striking "Marilyn" print. 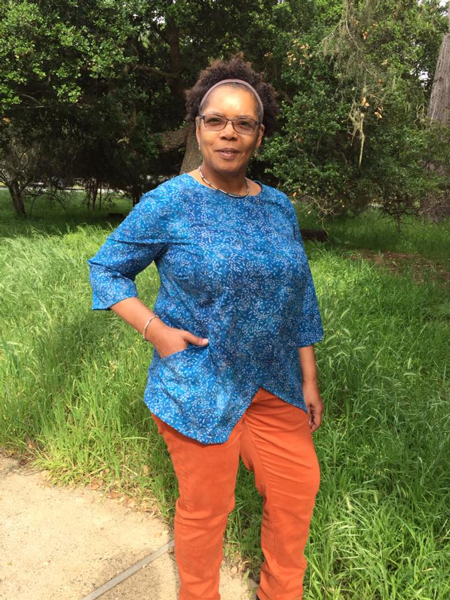 Sharon finished this tunic and ponte slacks she had started at the Jane's Auburn Sewing Retreat. 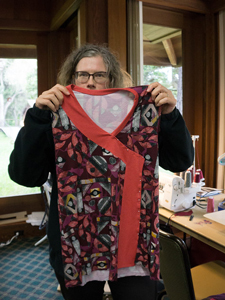 She also started another tunic using multiple red prints, and Jane helped her with their placement. 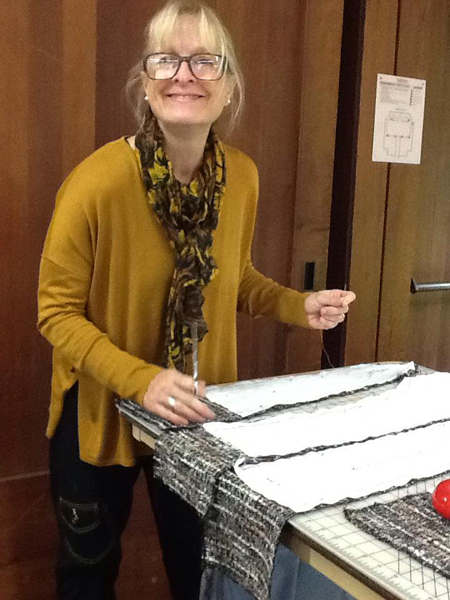 Laura worked on a StyleARC shirt at Asilomar....Jane is so happy to see her making something for herself. 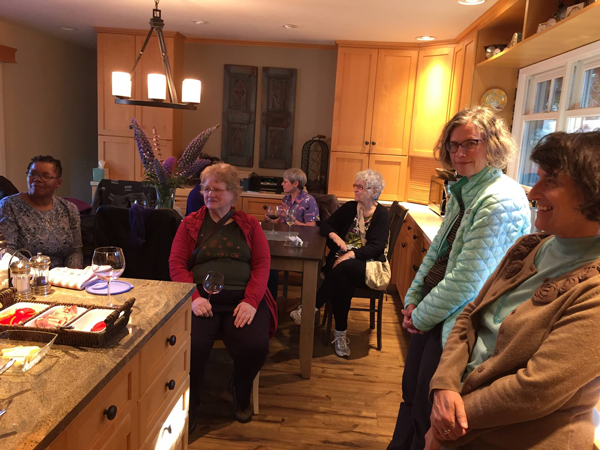 Maria had everyone over to her home in Pacific Grove for a delightful time. Thank you Maria.